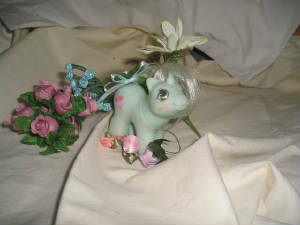 Newborn Baby Moondreamer.she is a newborn pegasus pony. baby Moondreamer has a half moon symbol and is a purple-pink pony with blue hair. she is one of my favourite ponies. 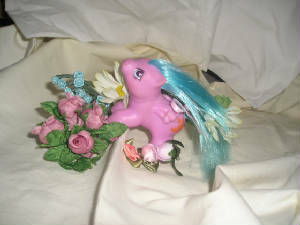 This is a brush and grow pony, her name is Bouquet. Bouquet has a Hat as her cutie mark. This mlp is a unicorn. This is a princess pony. She has nice long black eye-lashes. 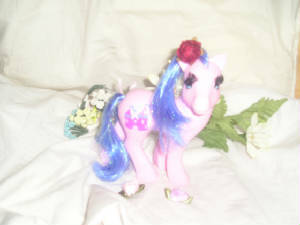 Although this princess pony has no name she is often called "Royal Pink". she has a castle as her cutie mark and Blue hair. 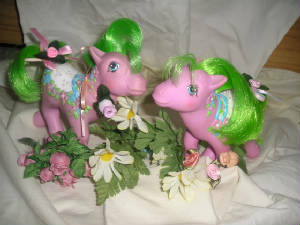 There are two ponies in this collection. The other pony is purple "Royal Purple" and she has dark pink hair, she also has eye-lashes. Butterfly Island ponies Left to right Fizzy pop, Strawberry reef and Island rainbow. This is a sparkle pony. Her name is Star Dancer. 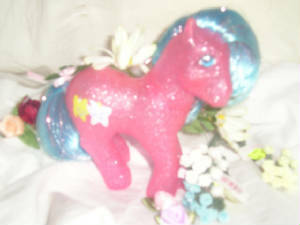 Star Dancer is a pink pony with blue hair. Her hair has sparkles in it.